STONE throwing youths attacked firefighters responding to a 999 call at the Glebetown Drive area in Downpatrick last week. Last Thursday evening’s incident — which has been roundly condemned — comes just weeks after a public protest called for an end to trouble after three vehicles belonging to pensioners cars were targeted by children throwing missiles. In one frightening incident, a elderly man was showered with fragments of broken glass after the driver’s window of his car was smashed. He also sustained cuts to his hands, prompting the Flying Horse Ward Community Forum to stage a protest against trouble in the area and appealing for an end to it. Members of the community group also appealed to parents to warn their children not to get involved in behaviour which could lead to a major incident. Police and politicians have condemned those responsible for last week’s incident at Glebetown Drive at the Flying Horse estate when a fire engine sustained damage. Local police say the incident “could potentially have cost a life” explaining that such unacceptable behaviour prevents emergency services from helping the communities who rely upon them. “We would ask parents to be aware of where their children are to help us stop this from happening and to make them aware of the possible consequences of these sorts of actions” said a PSNI spokesman. 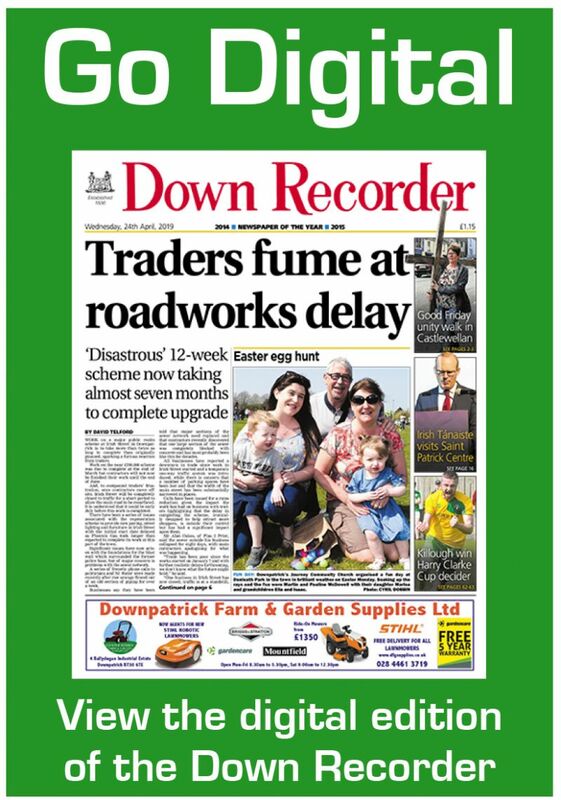 Downpatrick councillor Dermot Curran and the town’s Antoú election candidate, Macartan Digney, have hit out those responsible for the attack on the emergency services and appealed parents to keep a tighter rein on their children. Cllr Curran said he was “disappointed that trouble had raised its head again” at a part of Downpatrick which has been relatively quiet over recent months. “I had hoped that the recent public protest organised by community officials who are deeply committed to this part of the town would not be ignored,” he said. What are the parents of these children doing? Are they unaware of what their children are up to? Cllr Curran said a lot of money, time and effort had been invested in the Model Farm and Flying Horses estates which were now much sought after areas to live in. He said residents should not have to put with unruly youths and that motorists should be confident of driving along the Killough Road without fear of their vehicles being pelted with missiles. Mr Digney said the firemen were responding to an emergency call shortly after 7pm last Thursday evening when they were targeted. “While dealing with an emergency incident, a number of youths appeared and threw missiles at the fire engine,” he said. “While there were no reported injuries to any of the firefighters or serious damage to the vehicle, I would ask parents to know were their children are at all times.